The goal of my work is to create three-dimensional snapshots in time, inspired by the rich architectural heritage of the Midwest, especially in the Great Lakes Region, and to a lesser extent by my travels abroad. 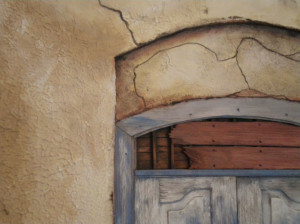 My art depicts commonly encountered, time-worn structures and utilitarian objects. Their weathered details tell a story; their mystery invites new stories to be told. The effects of variable ambient light on my work are enhanced by my use of recesses, jagged edges, and rugged textures. The atmosphere of each piece evolves throughout the day, as highlights and shadows shift. I use three basic formats: “corners” that project out from the wall, “flat” pieces that incorporate tromp-l’oeil elements, and “flat” pieces with sections that recede into the wall. With a focus on using re-purposed materials, I intermingle discarded architectural mill work, furniture manufacturing scraps, found objects, plaster, and paint to create my final product. There are no human subjects in my work; instead, the viewer is the human component. My hope is that each viewer’s personal memories and experiences will shape distinct and differing reactions to my work.